The new Pro-Ject DAC Box S2+ is a DSD-capable miniature high quality Digital/Analogue Converter that replaces the popular DAC Box S+ model. Fully equipped to accommodate the highest demands of the modern audiophile, it supports playback for PCM files up to 32bit / 768kHz and DSD decoding up to quad DSD (DSD256). DAC Box S2+ also comes with five digital filters, included with the ESS Sabre ESS9038Pro DAC chip, for adapting to the listener’s preferences. Three digital inputs ensure connection to any source available; i.e PC via the USB B input or a TV set via the optical input. With support for PCM files up-to 32-bit / 768kHz and quad-DSD decoding (DSD256) via the rear-mounted USB port, there's very little this compact device can't handle with ease. The clever internal design means unwanted noise entering the system via USB is double-filtered to suppress it to insignificant low levels. Fully Hi-Res Audio certified and Roon Tested, the DAC Box S2+ is more than comfortable in far more expensive audio systems. 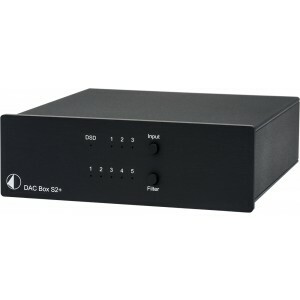 For alternative digital sources, the DAC Box S2+ also has an optical input and coaxial S/PDIF input (both limited to 24-bit/192kHz conversion), so nothing should be out of reach - whether you're looking to connect CD players, network streamers or a computer. Regardless of the input used, Pro-Ject's proprietary Optimum Transient Digital Filter and complimentary clock circuitry design allows the DAC Box S2+ to manage jitter down as low as 100 Femtoseconds, ensuring the tightest and most capable audio performance possible.